In honor of Birth Defects Awareness Month, Vocational Rehabilitation shares a story of overcoming hardship from birth and finding success in America. 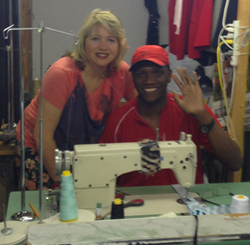 Pierre Garnaud, with his boss, Karina Bramer, at his job as a tailor. He is a very humble and lovely person. His disability is not an issue at my work place, especially for Pierre! Imagine being hidden away and ignored by your parents because you have a disability. Now imagine that not only can you not hear what other people are saying, they are speaking a number of different languages and are having a difficult time communicating with you. Well, that was what Pierre Garnaud, who is deaf, had to deal with as a child. But he didn’t hide away and give up. He taught himself how to sew and came up with a mixture of sign language and gestures to talk to others using a combination of French, Creole, and English. In honor of Birth Defects Awareness Month, Vocational Rehabilitation (VR) is sharing Pierre's story of overcoming hardship from birth and finding success in America. Pierre came to America seven years ago. He was determined to work, so he came to VR and met with Counselor Lucia Mavrakis. VR provided a number of services for Pierre, including hearing aids, eye glasses, interpreter services, clothing for his job interviews, and a monthly bus card. She also referred Pierre to Job Coach Ana Davis with Jewish Community Services to help him get ready for work. After working with Ana to learn how to get around using public transportation and to apply for different jobs, Pierre was excited to land a job at Alterations and Much More as a tailor. Owner Karina Bramer is very happy to have Pierre join her staff. Pierre communicates with his co-workers by writing and, when needed, Jewish Community Services provides an interpreter for him.